Why wear computer glasses? The remedy for computer eye pain is an eyewear called computer glasses. The anti-glare coating on computer lenses helps a wearer optimise vision, so that the eyesight is not compromised when the person spends long hours looking at a computer screen, TV, monitor or any other digital backlit screens. We cannot deny how efficient and convenient usage of computer has brought to us. However, prolong hour of computer usage can really harm our eyes. This is the very reason why computer glasses is highly recommended. Computer screens and any digital backlit screens emit blue light and UV rays, and a lens designed for computer glasses can filter out most of it, hence making it a very effective in protecting the eyes. By cutting off the blue light, it helps to reduce the risk of macular degeneration . Computer glasses is also slight yellowish compared to normal clear lens. The yellowish element helps to increase the contrast. Another feature of computer glasses is the ideal intermediate power . Since computer is considered as intermediate object, the power required to focus is not as high as for the distant object or as low as for near object (for avid glasses wearer). Thus, there will be a portion of the lens that comes with intermediate power in order to optimize the vision. How does computer glasses work? The main differences between “computer glasses,” “reading glasses,” & “regular/driving glasses”? Regular driving glasses are designed with ideal intermediate power, whereas spectacles for computer contain anti blue light coating. Known as anti glare coating too, computer glasses have lenses that are really meant to block out the harmful blue light rays from things like your phone screen. Reading glasses – is good for focus that is around a lap’s distance away. Reading glasses are perfect for reading and especially designed for focusing close distance for long periods. Regular glasses – are good for general usage, mainly for distant object. 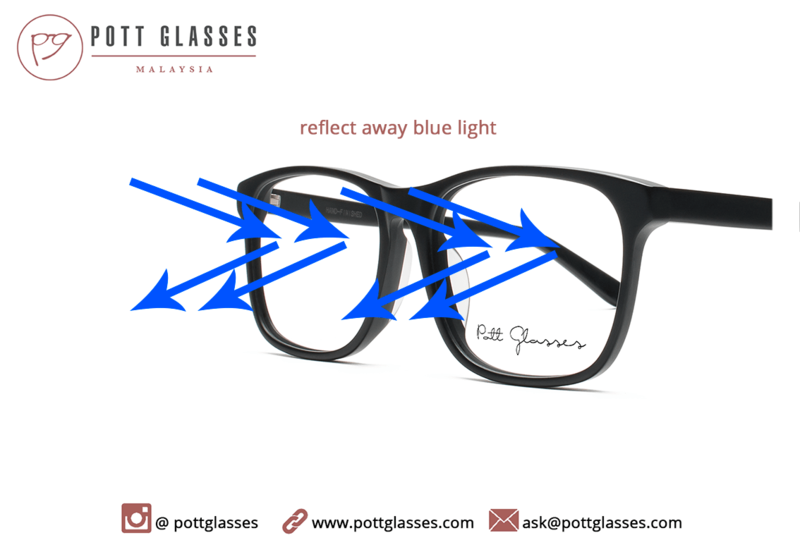 That having said, regular glasses can also add on the anti blue light coating . In this case, the glasses will work for any a daily activity, reflects away the harmful blue light from computer and smartphone screen. It just does not come with the ideal prescription for desk job work. Computer glasses – is good for focus that is slightly longer than reading distance. The ideal power works well for distance ranging from 35cm to 55cm which is where we place our computer. On top of that, has an anti blue light coating , like a tint that absorbs blue color rays. This blue-ish coating reflects away the harmful blue light of wavelength 410nm to 453nm. For practical usage, if you do a lot of work that requires focusing very close, such as working on computer work like writing, photography, IT works or accounting that require detailed observing, then the right glasses such as a computer glasses will be ideal. If you want a pair of glasses for general all-purpose, a one size fit all solution, then a regular computer glasses with anti blue light coating will be ideal. Next in our computer glasses sequel, we will tell you who should use anti blue light coating computer glasses, and we are giving out free styling guide to help you match glasses to enhance your look, stay tuned!